Abner Doubleday was a busy man. He rose to be a major general during the American Civil War, started the first cable car company in San Francisco, and is credited (though perhaps erroneously) with inventing the game of baseball. In 1861, he had the distinction as a captain to be second-in-command of Ft. Moultrie, one of the harbor defenses of Charleston, SC.. 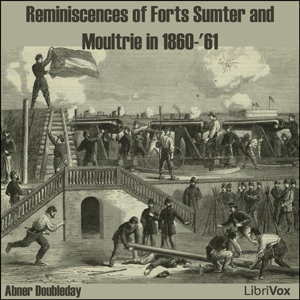 When that state seceded from the Union, Doubleday and the garrison of artillerists manning the fort were cut off from supplies and reinforcements. Through a tumultuous period, during which the command transferred to Ft. Sumter and soon found the Secessionists building batteries all around it, Doubleday had an additional target painted on him, as he was known as the only "Black Republican" in the fort and the mobs wanted to tar and feather him. Doubleday walks us through a day-by-day account of the final weeks before the new Confederacy opened fire on Ft. Sumter to begin the Civil War. Our busy man sighted the gun for the first shot fired by the Union in response. And we learn what it is like to be the target of thousands of cannonballs, until, nearly out of ammunition and food, the fort is surrendered with the honors of war and the men are evacuated to New York. The historical events are well-known. This first-person account allows us to experience them.